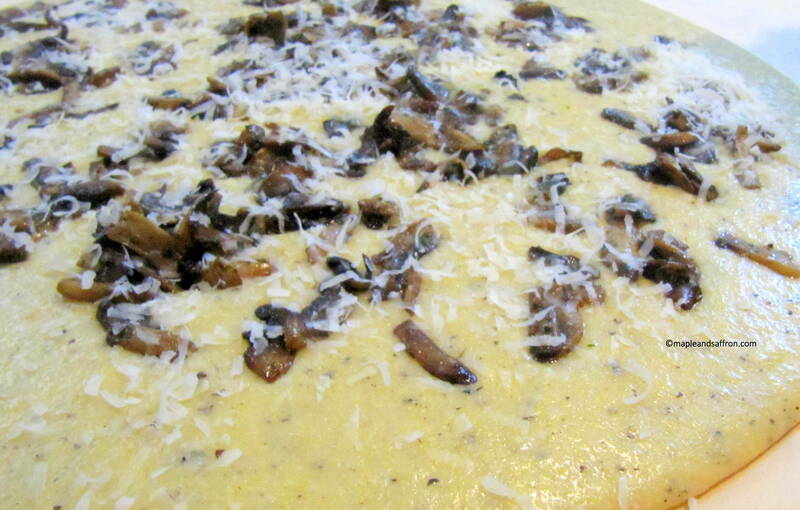 Home>Polenta with cheese and mushrooms! Many people think polenta is a Northern-Italy dish, but it’s also part of our culinary tradition in Abruzzo. The most common version you would find on a grandparents’ table is polenta with tomato sauce and sausages on top. We are very fond of this dish, because it brings back beautiful childhood memories every time we make it: the whole family, on Sundays, sitting around a huge polenta poured right on the wooden table, everyone eating together: no plates, only forks! Together with the most traditional one, we also make a “modern” version with cheese and mushrooms, very easy and delicious! 3 In a pan, put extra virgin olive oil and 1 glove of garlic. When garlic gets golden, add mushrooms. Turn up the heat and add white wine. When wine reduces, add salt and parsley. Cook until ready. 4 Put water in a pot with a bit of salt. When it boils, add polenta flour and keep stirring for about one hour (you don’t want it to stick to the pan). If you like it softer, add some more boiled water. When it’s ready, add the cheeses and keep stirring until they melt. 5 Put polenta in a plate (if you like it the traditional way, pour it on the table! ), add mushrooms and Parmesan cheese… and buon appetito!